I thought the press conference was brilliant, and am not surprised that everyone and their fish was likening it to a civil partnership ceremony – a piece of social vocabulary, of course, which we must remember that we have the Labour party to thank for. As a Classicist, though, I also couldn’t help but see it in terms of the inauguration of a pair of consuls. Consuls were more equal in rank than our new pairing, but there was an acknowledged ‘senior’ consul, who took up the office first and got to speak first in debates – just as Cameron did yesterday. Consuls also knew full well that they would have to serve together once they were elected – that, in fact, was the whole point of having two of them. The system was designed to ensure that no one person had a monopoly on state power, and for that reason, either consul could veto the actions of the other (‘veto’ simply being Latin for ‘I forbid’). Clegg and Cameron don’t seem to have any such formal mechanism for stopping one another’s actions, but of course in practice they do both know perfectly well that if either of them does anything which the other one seriously disapproves of, their coalition will fall apart, and both of their political careers will be over. So that’s a pretty strong motivation to work together, even if it’s not what they anticipated before the election. Consuls served for only one year, not five – and that certainly did lead to catastrophic short-termism of the kind David Cameron assured us yesterday that he wants to avoid. In particular, it encouraged consuls to rush headlong into military campaigns, since they knew that if they didn’t score a victory during their short time in office, that honour would go to their successor instead. But the five-year period was also pretty important in Roman politics. It was known as a quinquennium, which just means ‘period of five years’. (Isn’t it a lovely word, though? Any word with two Qs in it (and Latin has a fair few) has got to be good value for money.) In Rome, censors (whose responsibilities were different from what our modern word ‘censorship’ might imply) were elected every five years in order to perform a census of the general population and revise the membership of the senate – which is part of what’s just happened to parliament, of course, though not quite so directly at Cameron and Clegg’s initiative. Meanwhile, five-year periods of special military command became increasingly common in the late Republic, though they were never an official part of the system and always required extraordinary legislation to be passed. More on those in a moment. Not all consuls got on, of course. They were not like American presidential and vice-presidential candidates, running on a joint ticket for the same party. Roman politics didn’t actually have parties, anyway – the closest it came were factions, which were basically like modern political parties would be if they were only about tribalism, nepotism and power, and didn’t involve policies or (heaven forbid!) principles at all. Factions would, of course, try to get their boys into both offices whenever possible, but it didn’t always work, and sometimes bitter rivals shared office together. And if you think the Tories and LibDems can be described as ‘bitter rivals’, then let me tell you that the greatest gulfs which you can identify between them are as NOTHING compared to the rivalries of late Republican politics. Perhaps the most famous example of ill-matched consuls is Caesar and Bibulus in 59 BC. Caesar already had very powerful friends behind him – particularly Pompey and Crassus – and basically saw his consulship as a chance to secure everything that these three men and their cronies were after: land for their soldiers, preferential treatment for their legislation and lucrative appointments for the following year. Bibulus hated Caesar and everything he stood for. He began by trying to veto Caesar’s actions, but quickly found that his veto was actually meaningless, because Caesar’s supporters simply attacked him (with literal physical violence) when he tried to interpose it. So he then fell back on his position as an augur – a priest who divines the will of the gods by watching the behaviour of birds. Bibulus spent the rest of the year standing on the roof of his house, proclaiming that the omens were bad, and that therefore all Caesar’s legislation was contrary to the will of the gods – and, hence, invalid. Caesar just ignored him. Could he have been checking the omens? If he was, the birds were certainly all singing very nicely, and he doesn’t seem to have felt the need to declare that the meeting should be adjourned on grounds of being contrary to the will of the gods. So they must have been good ones. I hope they stay that way – but I also hope he remembers to keep checking. This entry was posted on May 13, 2010 at 09:18	and is filed under birds, julius caesar, latin, politics, roman history, roman religion. You can follow any responses to this entry through the RSS 2.0 feed. You can leave a response, or trackback from your own site. Brilliant post! Absolutely loved the comparison you draw up between Cameron and Clegg and the inauguration of Consuls. Wasn’t 59 BC referred to as the year of the consulship of Julius and Caesar? Poor Bibulus- I definitely wouldn’t want to be him. Thanks for your comment! Yes, you’re quite right about 59 BC being known as the consulship of Julius and Caesar. Poor Bibulus, indeed. I thought when the press conference happened that somebody needed to write this kind of piece – and here it is! You came up with so many more nice little echoes than I could think of at the time…. the role of the senior consul, and the whole idea about the quinquennium. 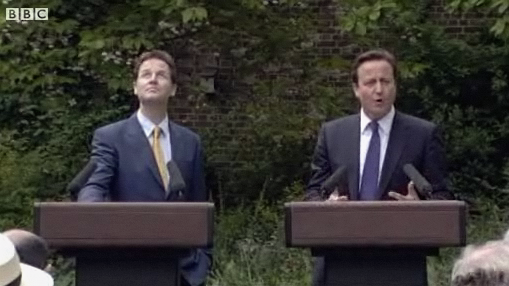 The idea about CLegg consulting the birds is just hilarious… and not a little poignant, even a month later…. He’s not going to be Bibulus, I think so much is certain. Thank you – I’m really glad you enjoyed it! :-) Yes, it seems now that he must have been seeing a few ill-omened birds up there after all, mixed in with the good ones – a couple of ravens and owls, maybe? It was that little sky-ward glance which really inspired me to write then piece, anyway. Three cheers for online BBC videos making it so easy to get just the perfect screen-cap. I don’t know – I think so far they have been doing pretty well, seeing the circumstances. I don’t want to get too political in somebody else’s space, but I have been impressed with how well the co-operation has been working (at least in the public eye). In some areas, it’s been pretty astonishing. Loved watching William Hague not quite knowing what to do while the Deputy PM was happily chatting away in very good German…. it’s certainly time for the Tories to learn a new style in dealing with Europe (and I am merely talking about style at the moment – don’t want to get into the other stuff)… And there have been plenty of interesting monents like that…. and as yet no eagles dropping hares and lightnings from the wrong angle. Though I still hope somehow that Clegg might perhaps climb his roof next Tuesday morning and report back to Westminster in good time…. it would certainly stir things up, don’t you think? Or perhaps that’s why they’ve got Simon Hughes now – to engage in strategic augury when the going gets tough…. Oh, I agree that cooperation within the coalition has been very impressive indeed so far. I just meant that there have been a few unlucky events coming out of left field, like the ‘scandal’ over David Laws’ expenses, or the news that the budget deficit is even worse than anybody realised. Nothing is ever completely smooth sailing though, is it?